Built in 1835, this Georgian mansion has been a private residence, school and home for nurses in its near 200-year existence. However, it is by far most renowned for its use by the Admiralty during World War II. Indeed, the oak panelled Admiralty Room was used by Sir Winston Churchill for secret, high-level Naval meetings. Other notable guests include Rudyard Kipling who stayed for a few days in the spring of 1915. 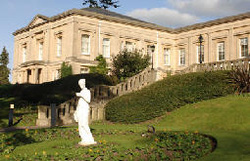 Now five-star accommodation, Bath Spa was officially opened as a hotel by Diana, Princess of Wales, in 1990. It boasts well over one hundred guest bedrooms with the Feature Rooms set within the original Georgian section of the building, and Imperial Suites within a separate wing.